Joining his earlier releases for The Matrix and Bill & Ted's Excellent Adventure, Keanu Reeves receives another Pop! 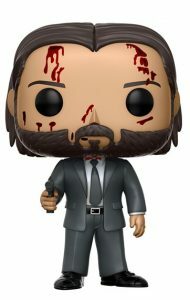 vinyl figure with 2017 Funko Pop John Wick Chapter 2. Released in 2014, the original John Wick film took moviegoers and critics by surprise. Portrayed by Keanu Reeves, Wick chooses to leave his life as an assassin behind to get married. However, John Wick suddenly finds himself in the middle of the action after a former Russian associate comes back into his life. Of course, John Wick: Chapter 2 picks up on the mayhem surrounding Reeves' character. Funko Pop John Wick Chapter 2 personifies the hitman to perfection. Standing approximately 3 3/4” tall, the main John Wick figure dons a silver suit and tie. His long hair is parted in the middle and tucked behind his ears, which can be seen just below his jawline. Shown with a full beard, Wick is also wielding his pistol. The John Wick limited chase variant (1:6 boxes) mirrors the base figure with the exception of the splattered blood on his face and on his white shirt above the silver tie. 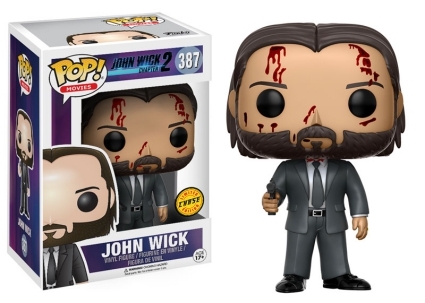 The John Wick: Chapter 2 set is part of the Pop! Movies line and the numbering reflects this. FUNKO POP! MOVIES JOHN WICK 2 VINYL FIGURE #387-NEW IN BOX-CHEAP!